University of Leicester researchers are leading a major new project to measure the temperature of the Earth's land surfaces. Evidence suggests that long-term trends in surface temperature can be an indicator of climate change. Satellite observations of surface temperature can provide unique and detailed knowledge to better facilitate the understanding of climate change. The Land Surface Temperature CCI project is part of a coordinated effort to understand surface temperature change across domains within the European Space Agency's Climate Change Initiative (CCI), which confronts the challenging set of satellite-based product requirements for climate. Accurate knowledge of land surface temperature (LST) plays a key role in describing the physics of land-surface processes at regional and global scales as they combine information on both the surface-atmosphere interactions and energy fluxes within the Earth Climate System. This provides important information across a range of disciplines including monitoring drought, impact on human health, and changes in vegetation. The team from the University of Leicester's Department of Physics and Astronomy, who are part of the National Centre for Earth Observation (NCEO) in the UK, will lead a consortium of thirteen international institutions representing the best expertise in land surface temperature. This consortium will work collaboratively on methods to produce the most comprehensive and well characterised global LST data for climate science. The team will use data from a variety of satellites to provide an accurate view of temperatures across land surfaces globally over the past 20 to 25 years. Recent research involving scientists at Leicester has shown that LST anomalies are closely related to anomalies in air temperature when averaged globally. This independent confirmation gives confidence to the general picture of a warming planet given by traditional climate observations whilst benefitting from the satellite ability to capture spatial variations of surface temperature. New LST sensors are already proving valuable in capturing current heatwaves and allowing unprecedented coverage of the UK in the sunshine. The team will exploit these new sensors and will develop innovative techniques to merge data from different satellites into combined long-term satellite records for climate. These will all be evaluated by scientists working at leading climate centres such as the UK Met Office, with the outputs made available in a single online archive managed by ESA. The project is a new component of a large programme run by the European Space Agency (ESA) called the 'Climate Change Initiative', whose objective is to support the United Nations Framework Convention on Climate Change (UNFCCC) by addressing 22 of the Essential Climate Variables defined by the Global Climate Observing System (GCOS). Dr Darren Ghent from the Department of Physics and Astronomy at the University of Leicester and NCEO, who is the Principal Investigator of the project, said: "Satellite observations of land surface temperatures, and their change, are increasingly important for evaluating models of the Earth system and for observing long-term change. 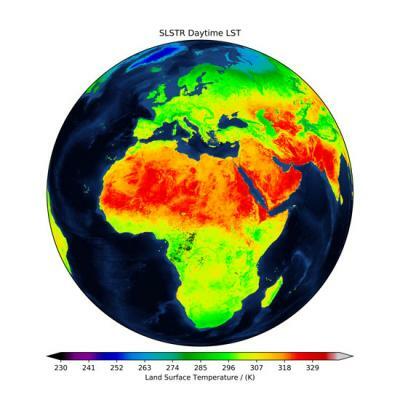 This University of Leicester-led project will make the significant steps forward to ensure the full potential of long-term satellite land surface temperature data is realised, to deliver the necessary improvements demanded for climate science." "The project aims to deliver a significant improvement on the capability of current satellite data records to meet the strict requirements for climate applications of land surface temperature data, through close cooperation between leading surface temperature scientists and the climate modelling and service communities." The LST CCI Project has just begun Phase I, which will run for the next three years; with Phase II expected to follow on from this. * Leicester is the UK's leading space city, home to the National Space Centre, Space Park Leicester and the University of Leicester's #outofthisworld space research. The European Space Agency's Climate Change Initiative (CCI) is a dedicated research programme whose objective is to realise the full potential of the long-term, global EO archives to generate satellite-based Essential Climate Variables as a timely contribution to the ECV databases required by the United Nations Framework Convention on Climate Change (UNFCCC) and Intergovernmental Panel on Climate Change (IPCC). The CCI exploits the Earth Observation archives that ESA has established over the last 40 years together, with its Member States. The CCI comprises 24 parallel projects each dealing with one ECV and involves over 100 European research institutions and private sector partners. How was Mediterranean diet associated with severity of psoriasis?